Composed by William Bay. Solo, Style, Classical, Contemporary, Perfect binding, Latin American, Solos. Latin. Book. 48 pages. Mel Bay Publications, Inc #WBM10. Published by Mel Bay Publications, Inc (MB.WBM10). ISBN 9780985922771. 8.5 X 11 inches. The tango is the king of the Latin dances. The captivating rhythms and seductive melodies of the tango have captured the imaginations of musicians and composers for many years. The tango has even found its place in the world of concert musical literature due to the fine works of composers such as Astor Piazzolla. It is hard to imagine a guitarist today without a number of tangos in his solo repertoire. 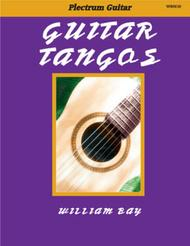 These 14 tangos were composed to provide tango literature for the plectrum or flatpick guitarist. Of course they may also be performed on the classic guitar. I would like to make special note of the tango, Lucia. I originally wrote Lucia as a guitar duet. The duet is recorded on my Acoustic Guitar Portraits recording and is also in print in the companion book. I composed a new solo setting for Lucia in this book. I believe these tangos may be performed in concert or recital, for fun or even on a gig. I hope you enjoy performing them as much as I did composing them! All music in notation and tablature.